My primary goal is to provide excellence in all facets of dentistry and to treat you and your family in a gentle and caring way using the latest techniques. Specifically, I strive to practice Minimally Invasive Dentistry, conserving your natural tooth structure, bone and gum tissue, thereby creating sustainable results. Since April 2007 I have been providing my patients with the tremendous benefits of Invisalign, and have attained Preferred Provider status.  There is perhaps no better expression of Minimally Invasive Dentistry than Invisalign. Having well aligned and cleansable teeth, with appropriate protected guiding patterns is fundamental to the Minimally Invasive approach, and the best way to reduce the likelihood of future dental treatment needs.